Securing homes and buildings quickly after a natural disaster is critical. Damage sustained to property resulting from floods, hurricanes, earthquakes, fires and other natural disasters compromise individual safety and property security. Securing properties with DAWGS steel door and window guards prevents properties from becoming hotspots for crime and vandalism. An unfortunate consequence that follows many natural disasters is an increase in crime and looting. 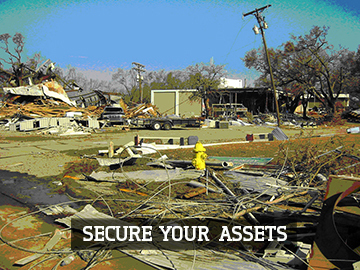 When a damaged, vacant property is not properly secured, it can attract a criminal element. Securing a property with DAWGS provides much needed peace of mind to property owners who have experienced a natural disaster. DAWGS door and window guards are made from impenetrable steel – which keeps buildings safe and secure. Unlike board-up, the coded steel door guard allows for managed access to the property so the repair and rebuild process can take place swiftly and efficiently. The DAWGS modular design allows it to secure standards as well as non-standard sized windows and entrances. Click here to contact our rental services department and learn more about your vacant property security options, or call us at 1-877-88-DAWGS (32947).